used on more and more crops. Since before Mary Shelley published "Frankenstein" in 1818, people have oscillated between concern that what scientists create in the lab will be dangerous and hope that research progress will improve their lives. But few scientific advances have created a wider spectrum of public debate than genetic engineering of living organisms. Many people see the importance of the technology and believe it is essential for developing new and improved agricultural products. Others object to genetic engineering on philosophical grounds or worry about the risks a genetically engineered organism (GEO) could present to people or the environment. Some people feel that scientists have not paid enough attention to potential risks. If GEOs are to maintain and increase their acceptance as new traits are introduced into more and more species, risk must continue to be clearly and openly assessed. The assessment of safety data is integral to the regulatory process of the three primary federal agencies responsible for regulating GEOs: USDA's Animal and Plant Health Inspection Service, the U.S. Environmental Protection Agency (EPA), and the Food and Drug Administration (FDA). Advances in our methods of carrying out genetic engineering and in our understanding of physiological and ecological processes allow scientists to maintain sophisticated and state-of-the-art procedures and controls for ensuring the safety of GEOs before they're allowed to be commercially raised. There's no question that GEOs are becoming essential to agriculture by making new traits available, helping agriculture be more environmentally sensitive, and reducing production costs. To remain competitive and environmentally sensitive, farmers need traits such as the insect and herbicide resistance offered only by transgenic crops. For all these reasons, ARS has become a leader in biotechnology risk assessment research. "For the past 4 or 5 years, ARS has coordinated and carried out more and more biotechnology risk assessment research and directed more resources into this work," says John W. Radin, ARS national program leader for plant physiology and risk assessment. "We've always done some research in this area, but today it's a very high priority." There are several areas of risk assessment that ARS is uniquely suited to study: creating more specific ways to transfer only desired genes, developing new models for doing risk assessments, finding ways to limit spread of transgenes, discovering ways to prevent new allergens from being created, ensuring that nontarget organisms are not put at risk by a GEO, and carrying out long-term monitoring to spot any emerging resistance to transgenic traits. Cotton was one of the first crops to benefit from laboratory genetic engineering. Genes from the bacterium Bacillus thuringiensis (Bt) were added to cotton, making the plant produce a protein toxic to several major cotton pests, including pink bollworm, tobacco budworm, and bollworm. Control of such pests had previously necessitated massive amounts of pesticide use. Since EPA approved its release in 1995, Bt cotton has been extremely successful in the United States and other countries such as China, India, and Australia. In 2001, transgenic varieties generated an additional $235.6 million in revenue for farmers while reducing pesticide use by 8 million pounds, according to a study by the National Center for Food and Agricultural Policy. But there's concern that widespread growing of Bt cotton may lead to insects developing resistance to Bt proteins, thereby canceling out one of the most potent but more environmentally friendly antipest tools. 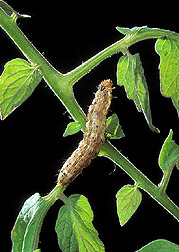 Resistance to foliar-applied Bt has shown up in Indianmeal moths, diamondback moths, and at least nine other insects. So, even though there's been no indication of resistance being generated by Bt cotton, EPA requested that monitoring studies be done. 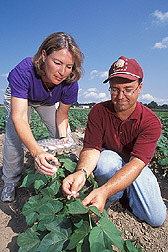 Each year, samples of insects are collected in fields all over the Cotton Belt and sent to the ARS Southern Insect Management Research Unit in Stoneville, Mississippi. "ARS is the perfect agency for conducting such a long-term, widespread monitoring study that will pick up the first signs of any insect resistance," says John Adamczyk, who, along with Carlos Blanco, coordinates the effort. Both are ARS entomologists. "ARS is national in scope, which helps when you are running a program that needs to extend from Virginia to Texas," Adamczyk explains. "We're even working on making this an international program, since the insects migrate from Mexico as well." But perhaps most importantly, he adds, ARS is an unbiased source of data. The agency has no financial stake involved if transgenic cotton is found to be creating a risk of insect resistance. "We report our results every year, and if we ever do start finding resistance, the industry is reassured that we have no agenda to simply take a technology away," says Adamczyk. While the impetus for resistance monitoring came from industry's need to provide EPA with data, Adamczyk sees the program as serving a wider audience. "We're providing a service to a $10-billion-a-year agricultural industry, but we are really protecting the public and the environment." (K4389-1) The group is also developing better methods that may serve as models for resistance monitoring in conventional pest controls as well as in transgenic crops. "We're also working on identifying genes that may control insect resistance to Bt," Adamczyk says. "If we can develop better information about that, we may be able to predict resistance very early—before we lose the effectiveness of Bt. Such a warning may allow us to do something about it in time." ARS's ability to be the objective voice, not beholden to any one group's agenda, allows the agency to work well with everybody. 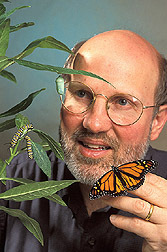 When a letter published in the May 1999 issue of Nature suggested that Bt corn threatened monarch butterflies, ARS was able to quickly coordinate groups with widely differing positions on GEOs to develop verifiable, sound, scientific data before any decisions were made, despite an initial flurry of media coverage and public concern. The concern was that monarch caterpillars eat only milkweed leaves, which sometimes grow in and around cornfields, and that Bt corn pollen falls on the milkweed leaves a short time each year. "Groups from the Union of Concerned Scientists to the Biotechnology Industry Organization, from universities to Monarch Watch, were willing to work with ARS to ensure we really did find out what risk, if any, Bt corn was to a nontarget insect like the monarch butterfly," says ARS entomologist Richard L. Hellmich. He's in the Corn Insects and Crop Genetics Research Unit in Ames, Iowa. How the issue was handled is being seen as a model for nontarget risk assessment research. First, the primary questions were researched. One: What dose of Bt protein from the transgenic corn varieties is actually toxic to monarch caterpillars? Two—and just as important: What are the chances that the caterpillars will actually be exposed to that dose? to that used with humans. The science showed that while a toxic dose is reachable, the potential for exposure is insignificant. "The final consideration," Hellmich says, "is to compare the potential for risk from using the GEO to the alternative—in this case, growing conventional varieties and spraying them with insectides. Certainly, chemical insecticides kill many more nontargets like monarchs than Bt corn does." Another concern widely discussed is ensuring that certain types of transgenic plants do not spread their new genes throughout the environment. Plant molecular geneticist David Ow, with the ARS Plant Gene Expression Center in Albany, California, is exploring ways to manipulate the DNA of genetically altered plants so that the transgene is deleted or inactivated during the physiological process of pollen production. "After all, it's not really the presence of the gene itself that's the concern, it's what the gene will do if it spreads to unintended hosts," he explains. If Ow can work out an effective technique, it could help decrease the potential for risk in all transgenic plants. "That's one of the reasons for ARS to do this kind of work. As a federal agency, we can allow anyone developing a transgenic plant to use the technique, because the public benefits when we decrease risk," he says. Another ARS plant molecular geneticist, James E. Dombrowski, with the Forage Seed and Cereal Research Unit in Corvallis, Oregon, is approaching the problem from a different angle. He wants to find a way to inhibit flowering in grass and forage crops. In addition to preserving much of a plant's nutritive value, no flowering would also mean no pollen and no seeds, which would virtually eliminate the chance of transgene spread. He has already identified some flowering genes in grasses. Dombrowski believes genetic engineering has great potential benefit, but he strongly advocates including risk assessment in transgenic research, "especially with plants like grasses that are wind pollinated and have the potential to cross with other plants," he says. "We strive to have solid information about what happens with transgenic organisms in the real-world environment, not just in the lab or under controlled conditions. We need solid facts, like how far pollen drifts, its fertility lifespan, and its competition level with other pollen. Some of the data must be collected out in the fields under production conditions to give the real picture of potential risk." Dombrowski says the public has a legitimate right to expect scientists to be concerned about the potential risks of transgenic crops. But, he adds, "I believe there's a lot of unwarranted fear due to a lack of communication. And in some cases, people aren't really thinking the issues and arguments fully through. "For instance, you take a gene from rye and put it into wheat to give it resistance to a rust disease, and people are suddenly concerned about what they're eating. But people eat seven-grain bread with wheat and rye in it every day. And in doing so, they're already consuming the combined DNA and proteins from both plants." Concerns about creation of new allergens are legitimate, and checking this out has always been part of the regulatory approval process. The assessment of the potential for new allergens in food is integral to the FDA process for reviewing transgenic plants. "The public has the right to feel confident about its protection," says ARS molecular biologist Eliot M. Herman at the Donald Danforth Plant Science Center in St. Louis, Missouri. "As we learn ever more about biological systems, we can provide even more specific assurances. Risk assessment will always be an evolving process." On the other hand, genetic engineering can actually make a food less allergenic. Herman did so when he created a hypoallergenic soybean variety that should not affect the 6 to 8 percent of children and 1 to 2 percent of adults who are allergic to soy. He used a technique called "gene silencing" to shut down the gene that codes for the protein thought to cause most soybean allergies in humans. So far, Herman has tested his hypoallergenic soybean with human sera and in sensitive animals. Testing to be sure allergens are not present is a difficult task. He is currently working with the University of Arkansas Medical School to develop an animal model that will allow for very sensitive allergen testing at the biochemical and cellular level. Such a model would be more explicit and a good addition to the feeding trials now required. One of the newest areas of genetic engineering is seeking to add to the nutritional value of crops. 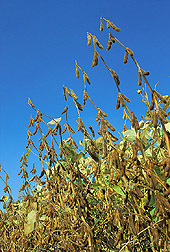 Herman is looking for new genetic, genomic, and proteomic methods to improve protein, oil, and nutritive value in soybeans. "While we focus on modifying crops to enhance their nutrition, we also look at genetic expression on a global physiological basis to detect any unpredicted negative effects," explains ARS plant physiologist Leon V. Kochian, with the U.S. Plant, Soil and Nutrition Laboratory in Ithaca, New York. He points out that if genetic engineering does have negative effects, they are most likely to be seen first in yield losses. "That would direct us to look further at changes," he adds. Kochian believes strongly in today's increased risk assessment. "Ten years ago, risk assessment research was largely a responsibility of the private sector. Increasingly, public research organizations like ARS have been stepping in. 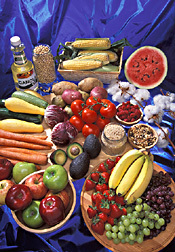 Two important reasons are, one, that USDA research can provide direct support for the needs of the regulatory agencies and, two, that many crops now being genetically engineered are small-market crops, such as fresh fruits. The reasons for making these crops pest resistant and reducing pesticide use are compelling, but companies are reluctant to pursue them because the small amount of acreage involved in growing these crops may preclude profitability." Plants, of course, are not the only life forms that have been genetically engineered. Livestock, insects, and microorganisms are being genetically tailored for traits that cannot otherwise be easily bred in. ARS animal physiologist Robert J. 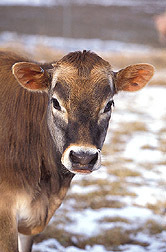 Wall with the Biotechnology and Germplasm Laboratory in Beltsville, Maryland, led the collaborative team that, in 2000, succeeded in adding genes for mastitis resistance to a cloned Jersey cow. He served as a subject matter specialist in the USDA Biotechnology Risk Assessment Grants Program workshop on research needs and priorities for animals last year. "A major difference in risk assessment for genetically engineered farm animals is that we don't have the same worries about transgenes escaping from them as we do with plants," Wall explains. "But we still need to make sure the meat and milk are safe to eat." The type of risk assessment needed is really determined by the kind of genes that have been added. "If what you add to a Hereford is an extra copy of a bovine growth hormone gene so that muscling is increased, that'll need a lot less testing than adding bacteria genes that don't exist in the cow naturally," Wall says. "And if the genes are for a product that's broken down in people's stomachs, that too will change the nature of the risk assessment. But the public is entitled to know that we have considered the risks in whatever we are engineering." That's the key to the future of genetically engineered organisms: The public must know that researchers have competently assessed any risk and that safety has been ensured.—By J. Kim Kaplan, Agricultural Research Service Information Staff. To reach scientists mentioned in this story, contact Kim Kaplan, USDA-ARS Information Staff, 5601 Sunnyside Ave., Beltsville, MD 20705-5128; phone (301) 504-1637, fax (301) 504-1648. You can date the history of genetic engineering several ways, considering how long people have been manipulating genes. 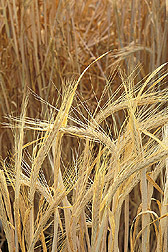 8000 B.C.—Humans domesticate crops and livestock and begin selecting for superior traits. 1863 A.D.—Gregor Mendel discovers traits are inherited through discrete, independent units (genes) and in specific, predictable patterns. 1919—First use of the word "biotechnology" in print. 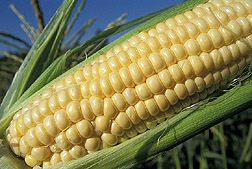 1933—Hybrid corn is commercialized, eliminating the option of saving seeds. Remarkable yields outweigh increased costs of annual seed purchases, and by 1945, hybrid corn accounts for about 78 percent of U.S.-grown corn. 1941—Term "genetic engineering" is first used by Danish microbiologist A. Jost in a lecture on reproduction in yeast in Lwow, Poland. 1946—Discovery that genetic material from different viruses can be combined to form a new type of virus, an example of genetic recombination. 1973—Stanley Cohen and Herbert Boyer perfect techniques to cut and paste DNA (using restriction enzymes and ligases) and reproduce the new DNA in bacteria. 1980—U.S. Supreme Court rules that genetically altered life forms can be patented and allows Exxon to patent an oil-eating microorganism. 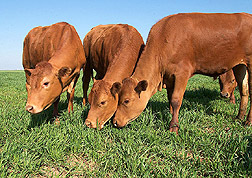 1981—ARS develops foot-and-mouth disease vaccine—the first effective subunit vaccine for any animal or human disease using gene splicing. 1982—Genentech, Inc., receives approval from FDA to market genetically engineered human insulin. 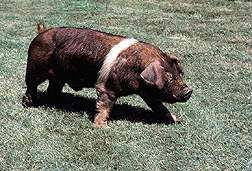 1984—First transgenic farm animals—sheep and pigs—are born. 1986—EPA approves release of the first genetically engineered crop, gene-altered tobacco. 1987—ARS develops microinjection technique to move a whole chromosome into a single cell of another plant. 1991—ARS develops gene-deletion technology to remove antibiotic resistance genes. 1994—FDA approves Flavr Savr tomato, the first genetically engineered food. 1995—Bt cotton and Bt corn get first EPA approval; registration was renewed in 2001. "ARS Leads in Assessing Risk in Transgenics" was published in the September 2004 issue of Agricultural Research magazine.